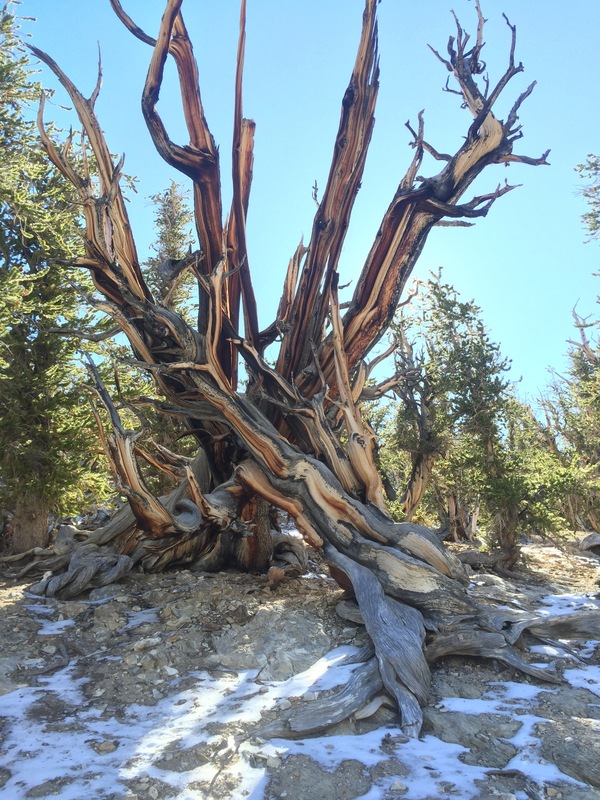 On Saturday we made the decision to go to the Ancient Bristlecone Pine Forest. We had almost decided against it because we were not sure we were up to another long ride with 6000 feet of elevation. I am really glad we decided to go because this was a great adventure. 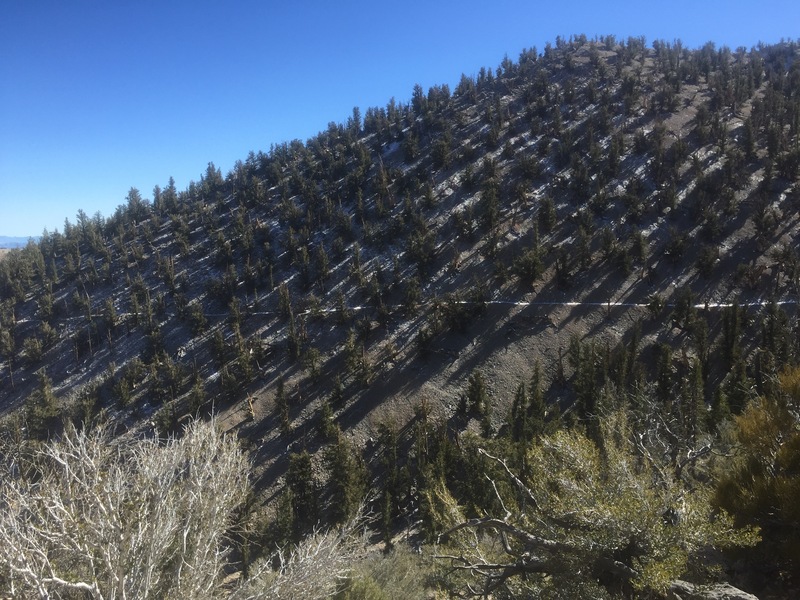 The road that leads to the forest is about 40 miles north of Lone Pine and then it’s another 24 miles of winding road that brings you from 4000 feet of elevation to above 10,000 feet. The snow line is right below 10,000 feet so we enjoyed a small blanket of snow upon our arrival to the visitors center. 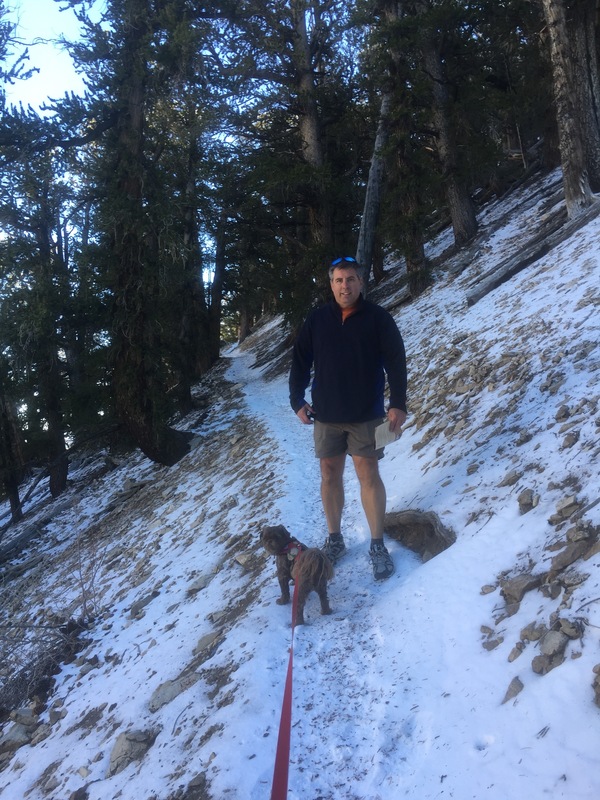 It was great to be in National Forest land, as there are a lot less rules about enjoying the land with your dog than there is at national parks. I ran into the visitors center to get information about hikes and they said to bring Gizmo in. Wow, this place was really dog friendly. They even invited us and others with dogs into he theater to watch the film about the bristlecone pines. The staff at the visitors center were friendly and knowledgeable. They enjoyed sharing their knowledge about these ancient trees with us. We learned that there are trees in this forest that are over 4600 years old and they suspect some might be close to 5000 years old. 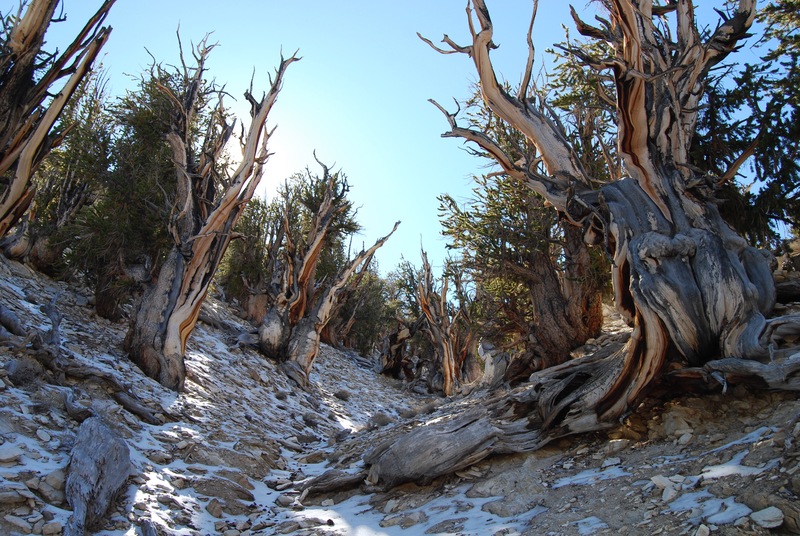 They have studied the living trees and the dead trees and have samples from trees that date back as far as the last ice ace, some 11,500 years ago. They use the tree samples to determine weather patterns based on the size of the rings for each year. We had planned to travel another 12-miles past the visitors center to see the Patriarch Grove but the dirt road leading to this area was already iced up. We decided to hike the Methuselah trail near the visitors center. The hike is 4.5 miles with 800 feet of elevation and the visitors center provided us with a self guided walking tour book to help us learn more along the walk. The walk took us about 2.5 hours because we stopped every few minutes for photos. This is a really cool walk and we learned a lot about these ancient trees and enjoyed seeing both the live and dead trees. 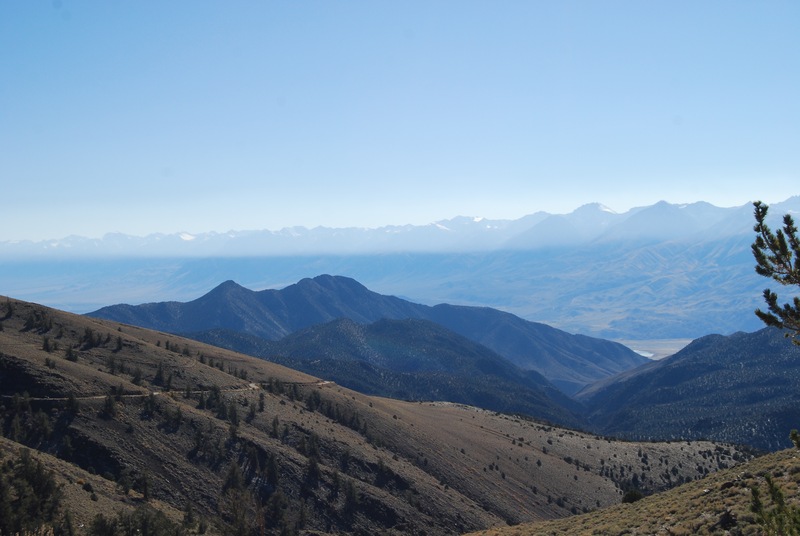 We left the cool environment at 10,000 feet and drove back into the valley where we were met with 80 degree temperatures. It just amazes me how much the temperature and landscape can chance with less than an hours drive. Today’s adventure is a drive up the Whitney Portal road and a hike up to Lone Pine Lake. We are here in Lone Pine until Tuesday morning. On Tuesday we head south to Menifee and end our I-395 adventures. We have had a great time exploring this area, but we can’t keep up this pace of exploration for 6-months! Chilly start to the hike. Temp was in the 30’s and there was some snow/ice on the trail. 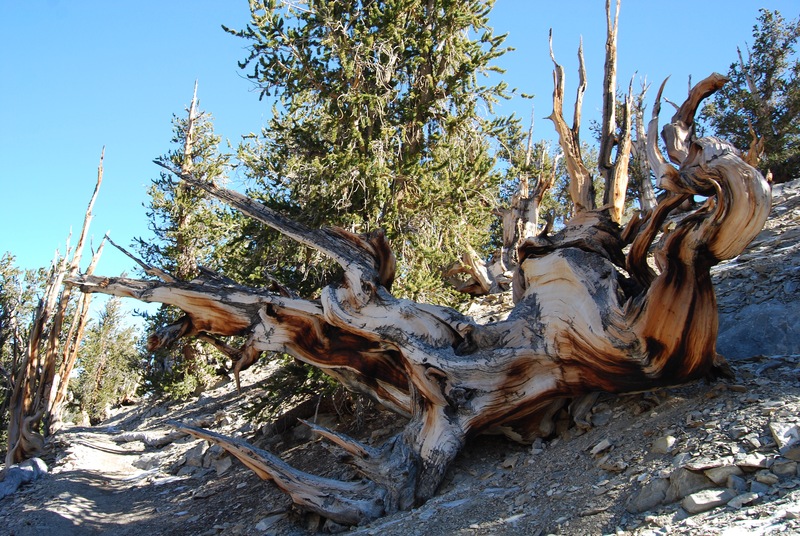 This entry was posted in Sightseeing, The journey west and tagged Bristlecone Pine, Lone Pine. Bookmark the permalink. Beautiful, I never heard of this place! Thanks for sharing.